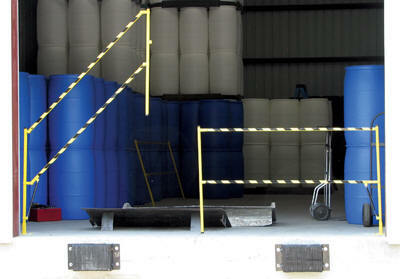 The Lift Gate can be lifted out of the way with a single finger. Simply lift and the self folding action folds the gate in a vertical position. With the assistance of the air assist cylinder the gate can be lifted with the slightest of effort. 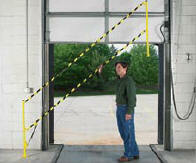 The Lift Gate is manufactured of steel tubing with a yellow baked-in powder-coat finish for added toughness. The unique design can be either wall or floor mounted. 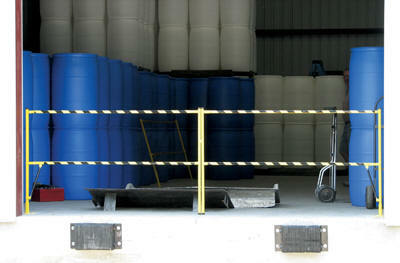 The Lift Gate is fantastic for mounting on loading dock doors to help reduce the possibility of people falling.